The Rocky Mountains are gorgeous any time of year, but the area is especially spectacular in the winter. The snow, like a coating of powdered diamonds, sparkles in the thin sunlight. The wind whistles and shakes the snow-dusted pines as black-capped chickadees chatter in the treetops. And as the blue-tinged dusk falls in early evening, the warm lights of lodges and restaurants give off a golden glow. 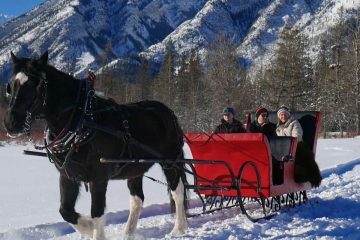 Snuggle under warm blankets on a sleigh ride and enjoy spectacular views of the valley and surrounding mountains, while a team of carriage horses glide you along snowy trails. Back at the stables you can warm up by the fire, toast marshmallows and enjoy a hot drink. Or, if you are looking for a romantic date, you can take a ride in a private 2 seat-cutter sleigh. A true one horse open sleigh for just the two of you with sparkling wine, chocolates and an real buffalo robe to keep you warm. 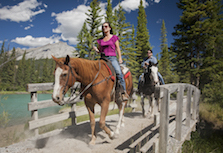 The excursion begins at Warner Stables and if you are interested to learn more about the operations of a working ranch, you can chat with the staff and visit with some of the Banff Trail Riders’ team. Heli skiing gives you the opportunity to soar high above the treeline to vast virgin slopes well off the beaten track. Surrounded by rocky peaks and glaciers, you’ll zoom through unmarred powder for the ultimate thrill. Intermediate and advanced skiers and boarders alike will love this adventure just outside of Banff National Park – it’s a chance not only to enjoy some great slopes, but also to see the mountains from a different vantage point. If your thirst for fluffy powder isn’t satiated, you can get a Tri-Area lift pass for the three ski resorts in Banff National Park – Sunshine Village, Lake Louise and Mt. Norquay. This will give you access to more than three thousand hectares of stunning alpine piste. Looking to ski further afield? Jump on a ski shuttle and spend a day hitting the slopes at Kicking Horse Mountain Resort or Panorama Mountain Resort. There are a couple of great companies that offer dog sledding experiences in and around Banff National Park. These allow you to traverse some of the most stunning landscapes in the Rockies, and then play with the beautiful huskies and feed them a post-tour treat. If you aren’t into the adrenaline rush of skiing or snowboarding, but you still want to soak up the pristine winter beauty of Banff, snowshoeing is the perfect adventure. Discover the extensive network of scenic, well-maintained snowshoeing and cross country skiing trails that Banff has to offer. 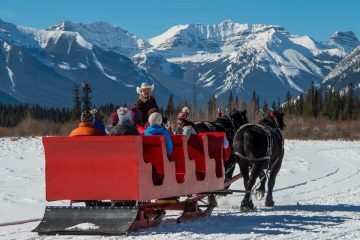 You can rent snowshoes and go exploring on your own, or go on a guided trip to one of many scenic spots near Banff such as Marble Canyon. With snowshoes on, you can crunch quietly over the snowdrifts and go deep into the quiet, frosty forest. Listen to the twittering of the birds, the rustling of the trees and the icy wind as you soak up the peaceful solitude. Venture deep into the wilderness and stay at Sundance Lodge, a quintessential mountain cabin with comfortable beds, rough-hewn log construction and a crackling fire. 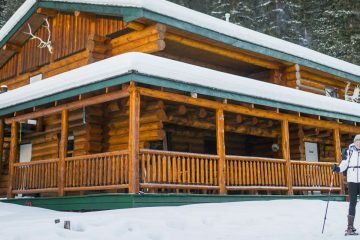 Located a gentle 16km (10 mile) bike, ski or snowshoe from the Banff townsite on a bend of Brewster Creek, Sundance Lodge is solar-powered and kept nice and toasty with wood heat. The lodge has 10 sleeping rooms, a large country kitchen, and a cozy living room area where you can curl up by the wood burning fireplace and lose yourself in a good book. And after a day spent snowshoeing or skiing in the fresh mountain air, you’ll appreciate an added comfort – hot showers! What better way to end a great day of winter adventure in the Rockies? What have you discovered in Banff’s backcountry this winter? Next postWhat Type of Cowboy Are You?